I had to be on crutches to let the bone bruising heal. I had 90 degrees ROM going into surgery as they thought cartilidge may have been in the way. I had surgery on August 10th. My ROM and extension never really came around. I was around 90 for ROM and my leg would not straighten. 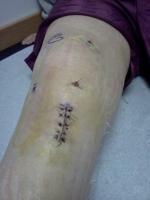 I had a second surgery to remove scar tissue on Sept.28th. I am 3 weeks out and my leg can straighten however my ROM is only at 90 degrees and super stiff. After talking with a physical therapist not even 3 weeks out he thinks my scarring has formed again. Wondering if anyone else is or has been in the same predicament? I have been going to PT 5 days a week and rehabbing on my own. I have been extremely frustrated and mentally tired. Any success stories pertaining to this? At first I wanted to get back and play at a high level. Now I just want to walk normally and be able to run after my 2 year old daughter.